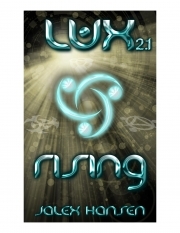 Description of "Lux 2.1 Rising (Lux Series) (eBook)"
Rising is the fourth book in the Lux series. Uniting underground, the Lux and the rebels find out more about each other than they expected and prepare to rise to the surface. Lux Omnibus Volume 1, containing Seeds, Call to Arms, and Alliance is now available from your favorite digital retailers. Reviews of "Lux 2.1 Rising (Lux Series) (eBook)"